Karim Kharbouch (born November 9, 1984), better kent bi his stage name French Montana, is an American hip hop recordin airtist. Born in Morocco, he immigrated tae the Unitit States wi his faimily when he wis 13 years old. He is the founder o Coke Boys Records, an its predecessor Cocaine City Records. In 2012, he signed a jynt-venture recordin deal wi Bad Boy Records an Maybach Music Group. Kharbouch made his mixtape debut in 2007. In 2010, he haed his breakthrough wi "Choppa Choppa Down". He released his debut studio album Excuse My French on Mey 21, 2013. In Julie 2017, Montana released his second studio album, Jungle Rules, which peaked at number three on the Billboard 200. The album wis supported bi the single "Unforgettable", featurin Swae Lee, which acame Montana's first song as lead airtist tae reach the tap 10 on the U.S. Billboard Hot 100. ↑ "French Montana: Homecoming". The Fader. September 25, 2012. Retrieved January 9, 2014. 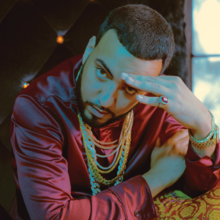 ↑ "Stupid Dope interview with French Montana". Stupiddope.com. January 27, 2012. Retrieved January 7, 2013. ↑ "French Montana's "Excuse My French" Pushed Back Again". Hotnewhiphop.com. Retrieved March 8, 2013. This page wis last eeditit on 20 October 2018, at 13:57.